There most popular way to attach and repair wooden features in a home is with a screw. Thresholds and other features that are prone to a lot of abuse are normally screwed into place. The problem with screws is that, while they are the one of the best ways to hold wood together, there is nothing more unattractive than a nice piece of hardwood with the head of a screw sticking out. 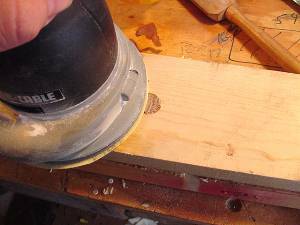 This article will show how to finish off a screw hole so that it looks nice and fits into the overall decor. "Mushroom" plugs may also be used to conceal screws but not on floors. Initially, you will need to decide what size dowel to use in order to conceal the screw heads. Normally something 3/8" to 1/2" will do. It is customary to use dowels made from the same species of wood as the surrounding woodwork. Different species of wood will create accents. Once the screw positions have been identified, use a sharp spade bit (or forstner bit) of the same size as your dowel to drill a shallow (1/2") hole. If the "spurs" on the bit are not sharp, they may not cut cleanly. Make sure to hold the drill square to the face of the workpiece or the hole may become too large. Once the first hole is drilled, use a standard twist bit to complete your pilot hole. This hole should be drilled in the center of the first hole. Using a spade bit for the first hole makes this easy as the spade bit has a large spur in the center of the bit which leaves a nice hole. Use a twist bit that is the same size, or smaller, than the shank of the screw. Drive the screw into the pilot hole. Some professionals like drywall screws for this purpose as the drive fast and hold well. A traditional wood screw works just as well. The specific type of screw that is used will depend on the circumstances. Galvanized screws, for example, should be used in areas that are exposed to moisture.